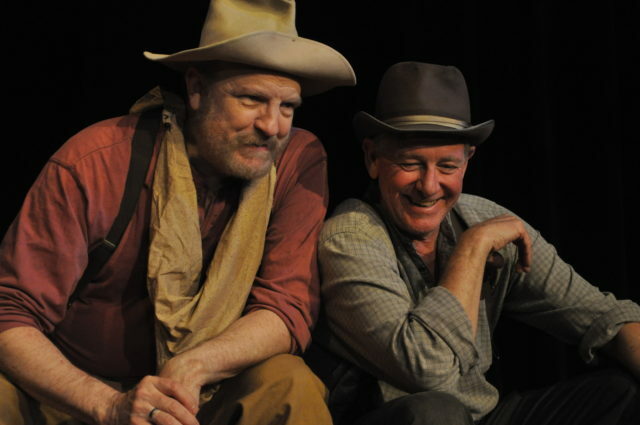 The Night Forlorn re-imagines Samuel Beckett’s Waiting for Godot as a Western where two none-too-bright cowpokes–Jim Beaver as Percy and J. Downing as Elvin–await their leader, Godsford. Both leads skillfully portray very authentic Western characters. The first-rate cast playing other tumbleweed characters includes Tom Allard as Godsford, Leslie Caveny as Patsy, June Schreiner as Tag and Robert W. Laur as John. David Mingrino. This quality production was made possible, in part from a grant from the Kaplan-Loring Foundation. The late Marvin Kaplan was a busy and successful character actor and writer who loved Theatre West. I’m sure would approve of this fun and creative venture. The show is now playing at Theatre West on Cahuenga. General seating is $25 with discounts for seniors and students. Visit the website or call 323 851 4839. The Night Forlorn (or, Waiting On Godsford) plays Fridays and Saturdays at 8 pm and Sundays at 2pm until April 22. This entry was posted in Theater, Upcoming Events. Bookmark the permalink.